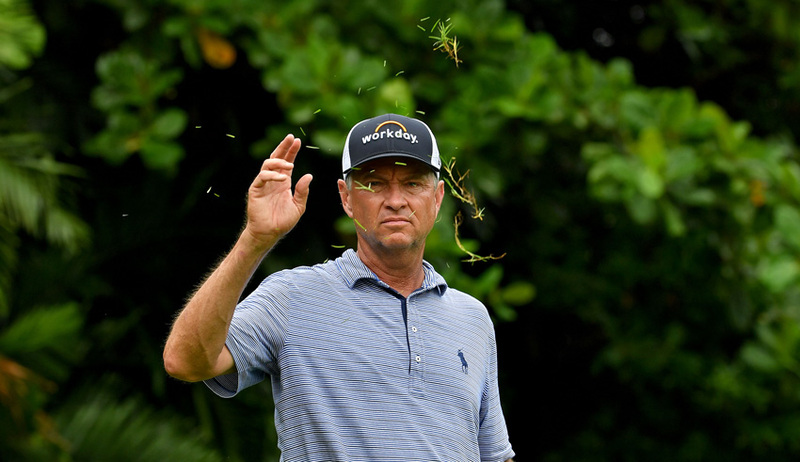 It was not quite love at first sight but having played two competitive rounds at the SMBC Singapore Open, American legend Davis Love III has fallen for The Serapong at Sentosa Golf Club. The award-winning Serapong – the home of the SMBC Singapore Open – has many admirers and World Golf Hall of Famer Love has added his name to that list. Love, 54, has played on hundreds of golf courses worldwide during his illustrious career so knows a gem when he sees it. “I love the greens, they are fabulous. Well I don’t love 18 quite as much as the rest of them, as (I had a) four putt there (Friday),” said Love, who has carded rounds of 69 and 68 as he hunts the title and one of the four available spots in The Open at Royal Portrush in July. “The greens are great, the fairways are perfect. It is a wonderful course and it’s tricky off the tee. The SMBC Singapore Open and The Serapong were named Tournament of the Year and Best Golf Course respectively at the 2017 Asian Tour awards and The Serapong was ranked 79th among the World’s 100 Greatest Golf Courses by Golf Digest in 2018. Now that he has played a few rounds at Sentosa Golf Club, and knows how the course plays, Love said that he needed to be more decisive with his play over the weekend. “I’ve just got to be a little bit more confident with my club selection and my targets off the tee,” said Love, who has won 21 times on the PGA Tour.